ISTANBUL (Reuters) - Finance Minister Berat Albayrak assured international investors on Thursday that Turkey would emerge stronger from its currency crisis, insisting its banks were healthy and signaling it could ride out a dispute with the United States. 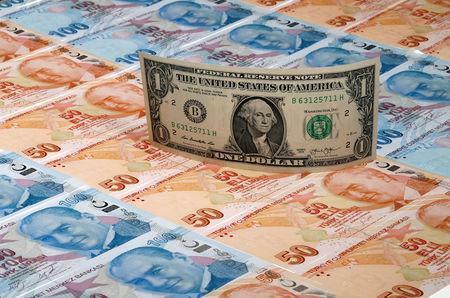 Turkey, he said, has no plans to seek help from the International Monetary Fund or impose capital controls to stop money flowing abroad in response to the recent collapse of its lira currency. Before he spoke, the lira strengthened more than 3 percent, despite signs that the dispute with the United States is as wide as ever. Trump has used trade tariffs in a series of disputes ranging from with Turkey and China to the European Union. However, in a potential complication, a foreign ministry source in Berlin said Turkish police had arrested a German citizen. ARD TV reported the man was accused of "terrorist propaganda" after criticizing the government on social media. In another element of the row with Washington, a U.S. court sentenced a senior executive of state-owned Turkish lender Halkbank to 32 months in prison in May for taking part in a scheme to help Iran evade U.S. sanctions. The pastor row is one of several between the NATO allies, including diverging interests in Syria and U.S. objections to Ankara's ambition to buy Russian defense systems, that have contributed to instability in Turkish financial markets.